WHAT'S INSIDE THE LIFETIME DEAL? Learn the "viral" strategy that has helped founder Jack Paxton scale eCom stores to $150 million in profitable Facebook ad spend PLUS get VYPER lifetime for $499. VYPER is a viral contest & rewards app. For this deal only you can get lifetime access to VYPER for a 1 time payment instead of paying monthly subscription fees! Ready to grow your eCommerce store with Facebook & Instagram ads? But, first... who am I? I started my career in Facebook ads at an agency, where I was the head media buyer for several multi-million dollar accounts. Some of my biggest successes include Home Chef (acquired for $200 million), Yoga Club, MyIntent, FabKids, BPN Nutrition, and AppSumo. Afterwards, I founded several startups including VYPER (SaaS) and Top Growth Marketing (my digital agency). After spending over $150,000,000 on Facebook & IG ads (yes, $150 million), I've learned quite a bit about running ads for eCommerce stores. But let's focus on why YOU'RE here. You want to learn how to use Facebook ads to exponentially grow your business. Let me teach you the strategies I used to scale eCom stores from $0 to $40,000 a day in profitable ROI-tracked ad spend. It's getting harder and harder to stand out on Facebook and Instagram. Paid traffic is getting more expensive as buying ads on Facebook is getting 70-90% more expensive every year. Traffic channels lose effectiveness as people copy the same campaigns. Facebook is closing down their targeting options to protect user's privacy. The average person in America is exposed to 5-10k ads a DAY according to Forbes & CBS News. So with all of this being said, is it still cost-effective to use Facebook and Instagram to grow your business? Because the ones putting in the work, learning new strategies and taking advantage of new advertising techniques WILL get ahead of the curve. In my course, you'll learn what marketers are doing today to stay ahead. People don't want to be sold to the old fashioned way -- with deals and limited time offers. They want to be ENTERTAINED. They want to ENGAGE with the brands that they buy from. Facebook wants to deliver better ads (and better "content") to people. The more social proof your ad gets (aka the more people "like" and engage with your ad), the cheaper your marketing gets. This is because they want to reward marketers for creating engaging and relevant content. But the problem is that cold traffic (traffic from users who have never heard of you) is notoriously hard to convert, and it's even harder to get them to click the share/like button. But if you can't get cold traffic to work, you can't SCALE up your ad spend, because you can't get enough new people to your product and make enough profit to fund the scaling. Raise your hand if you're stuck with only remarketing ads because cold traffic (prospecting) is killing your conversion rate and preventing you from scaling. Scaling is one of the hardest things to do as a business owner and I help companies every week overcome this. So how do you utilize cold traffic to actually make your ads INCREASE in relevancy scores? I teamed up with a programmer to create VYPER. A software that helps you create viral contests (aka the engagement generating machine). Viral contests happen to solve both of these issues. But only if you know how to leverage them in the right way. That's what the crux of my secret strategy is -- you'll learn how to leverage viral contests to feed your top of the funnel traffic (cold traffic) AND increase relevancy, engagement and conversions all at the same time. To utilize this strategy, you'll need to learn my core Facebook ad fundamentals. So this course will also show you how to set-up a winning ad account, make ads that are irresistible for your audience, and create high-converting copy. This course is the culmination of 7+ years in digital marketing, and over $150 million spent in Facebook ads. Take a seat next to my computer, where I'll show you exactly how to build a profitable eCommerce business with Facebook. The 3 pillars for growth and how they work together. What elements make them profitable? All templates: Leaderboard, prelaunch, eCommerce, and more! Use your own domain: Embed VYPER on your own domain, either as a widget or a form embed! They call me... the Anti Tai Lopez. While most Internet marketers prey upon the average Joe Schmo who will never see real results from their get-rich-quick-schemes, Viral Facebook Academy is aimed at entrepreneurs with REAL eCOMMERCE BRANDS and those who take action. Reality check! Making money is not easy! Everyone's "overnight success story" has taken them years to get to that point. I'm here to tell you that if you work hard, and apply these techniques, you can quickly see a 20, 30, even 50% increase in ROI on your Facebook ads in 30-60 days. And you can go from spending $100 a day, to $1,000 a day, to $10,000 a day, profitably. If you're ready to scale your eCommerce store off the back of Facebook ads this course is a no-brainer. I've never run Facebook ads before? Absolutely. This course is designed to give you a complete overview of Facebook ads before delving into any advanced techniques. I don't have an eCommerce store? While this course is aimed at eCommerce store owners, many principles will still apply for other businesses as well. However, the core of my teachings will be for eCommerce stores. If I'm a newbie at marketing? Yup. We show you exact ads that have worked for us, so you can take the guesswork out of creating ads and copy. If I'm trying to get rich quick? HELL TO THE NO. Please go to TaiLopez.com for that. What's included in the lifetime deal? This LTD is for the VYPER pro plan, so it comes with VYPER pro. Can I stack the deal? We are allowing customers to buy an add-on to double their monthly limits. Why is your training special? We have put together a lifetime deal and course which highlights exactly how to use your lifetime deal to make 10, 100 or even 1000x your investment back. We don’t just want to give you the tool, we want to show you how to use it to grow your business! Does this work for people outside the US? Yes, we have a huge range of customers outside of the US which is why we made VYPER translatable into any language! How long does it take to start making money from these tactics? VYPER campaigns can be up and running in under 15min using the Quick Start option. Generally a campaign can take a few hours to get up and running. Remember that you get out what you put it, nothing in life is guaranteed. So make a change in your business and put some effort into this marketing initiative and you will get much more in return. Does this just work for Facebook? This process and technique we will teach you will work on any platform, we use Facebook in all the examples as it is the most common. Does this work without Facebook ads? Yes, you can leverage these tactics and marketing campaigns using organic only marketing. We cover those options in a bonus section. And get some freebies while you're at it! 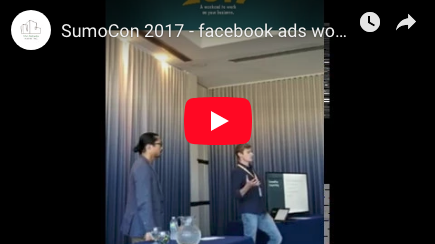 Watch my presentation on the left, where I spilled the beans on creating great Facebook ads for the SumoCon conference (tickets cost $900). It has truly been a gift to have worked with Jack. 1) truly an expert at digital marketing, 2) understands and cares about our needs and goals , 3) selfless in teaching and empowering us, 4) genuinely pleasure to work with and be around. Jack was instrumental in growing accounts to multimillion dollar status, all within the tightest performance-driven ROI requirements. The truth is that it's not that hard to stand out if you know how. Stop following the crowd, think outside the box. To start winning in the digital marketing space you need to start thinking outside the box to overcome these hurdles. It’s not as hard as you think to stand out though since everyone is doing the same boring marketing tactics. From today onwards start doing these small things to take your marketing to the next level! Run marketing campaigns that are out of the norm, be unique. What can you do to engage, entertain or shock someone? Test and try campaign ideas and strategies that may take a little longer to set up but no one else is doing. This gives you a leg up on all the lazy marketers. Get creative with your campaign messaging, copy, videos and images. Are you interesting, is your content "shareable"? Provide value to users. How can you make your ad or offer memorable. Leverage incentivization and gamification. This is the key to social media marketing. These are just a few ways you can start standing out from the 5-10k brands the average person sees a day! If you need a little help understanding these concepts join me below! An action packed 15 course section that dive into how you're going to start growing your business with Facebook & Instagram. Into and the tools we will be using. Intro to Facebook ad accounts. The profitable FB ad account setup. How to create converting ads. Setting up the bottom of the funnel. Setting up the top of the funnel. Intro to contests & examples. Use cases & choosing the correct contest type. How to find converting audiences. Optimizing top of the funnel campaigns. Optimizing bottom of the funnel campaigns. Leveraging referral marketing with rewards programs. We plan to keep this course up to date and expanded on over time as we test and discover new marketing tactics. Get access to one of the most in-depth courses on how to actually scale your business with Facebook ads. This works for new and established brands, we're so confident, that we'll even offer a 30 day refund policy if you watch the entire course and see no results!